This cricket games glossary is divided into 2 parts that includes an introduction and a learning games section for new cricket players and fans. Cricket games glossary is dedicated to passionate game players and fans that compete, watch this favorite of sport games. Cricket, also known as the gentlemen's game, was first played in the 16th century in England. A bat and ball are the two major components used to define the sport. Cricket is played between two teams where each team consists of eleven players performing various roles. Cricket action is on a circular or oval shaped grounds and the centre is the location of the 22-yard cricket pitch. This pitch has a major role in determining the outcome of the match as judged by two on-field umpires. The British took the game of cricket around the globe. In 1877, the first test match between England and Australia was played at Melbourne. 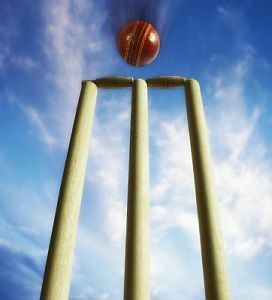 Cricket was included for the first time in the Summer Olympics in 1900 but due to the length of a match, it was removed. The International Cricket Council=ICC and the Marylebone Cricket Club=MCC maintain the rules of cricket also known as the Laws of Cricket. Each team has to bat and bowl at least once depending upon the format of the game. The objective of the team batting first is to score as many runs as they possibly can. The team batting second has to score one more run than their opponents to win the match. Cricket consists of three parts: batting, bowling and fielding. Batting is the part of the game where the batsmen wearing heavily padded equipment play to score runs. A batsman has two areas to score on, the offside and the onside. Bowling is the part where the bowlers look to use the 5.5-ounce leather ball to dismiss the batsman. There are ten ways of dismissing a batsman in cricket. Fielding, although not as important as the other two, includes the job of preventing the opposition from stealing runs and catching the ball to dismiss the batsman. Fielding can play a useful part in the overall result. There are three formats where cricket is played today. The first and original format is Test Cricket, which can last up to five days, sometimes without a result. Each team can have two innings of batting and bowling. One-Day Internationals=ODIs were introduced in 1971 and produce a definitive result over the course of a single day with each team batting and bowling for 50 overs. The third format is Twenty-Twenty or T20 that was first played in England in 2003. It is the most popular format of cricket wherein each team bats and bowls for 20 overs only. Cricket is a sport dependent on weather and is usually played in the summer months in Europe, Africa, Australia and New Zealand. All Out: refers to a team having lost all ten of its wickets in an innings. All Rounder: a very valuable cricket player who can both bat and bowl well. Appeal: the act of bowlers or fielders shouting at the umpire to ask if the batsman is out. Arm Ball: bowled ball with no spin that remains on a straight line. Asking Rate: required runs per over for a win. Ball: refers to the 5.5-ounce leather ball with a cork core.Tampering: to change the condition of the cricket ball artificially is an illegal act. Bat: the wooden equipment with which the batsman strikes the ball. Bat-Pad: term for field position calculated to catch the ball that pops up off the bat. Beamer: a very dangerous ball that does not bounce after leaving the bowler’s hand and reaches the batsman above the waist. Belter: pitch that is to the batsmen's advantage and not to bowlers. Bouncer: pitched ball passing by a batsman’s chest or head area. Boundary: the perimeter of the playing area often used in reference to four or six runs scored by the batsman. Box: term for padding/protector used by batsmen and wicketkeepers. Buffet Ball: very poor delivery that allows the batsman to help himself to some easy runs. Bump Ball: played ball hitting the ground and quickly caught by a fielder. Bye: ball untouched by batsman resulting in a run scored. Cameo: brief but very fast scoring innings by the batsman. Carry the Bat: refers to an opening batsman who does not remain until the end of the innings. Charge: attack by batsman departing from the crease and possibly converting the ball into a half volley. Chest-on: term for bowler who moves the ball utilizing his chest, rather than side on. Chucker: term for bowler who throws the ball. Closing the Face: hitting the ball to the leg side by rotating the bat inwards. Corridor of Uncertainty: refers to batsman's off stump decision to leave or play the ball. Cross Bat: term for holding the bat horizontally and striking the ball that can result in hooks, pulls and/or cuts. When the popularity and excitement of the game of cricket was discovered, we knew that it was mandatory to include this sport gamerisms glossary.